Submitted by bealzebub on 2014-10-29 17:11. "Ye want this ol' moneylender's advice on entering Halaster's Hall yet again? My advice is this: Don't. There's precious few treasures worth the death and agony and fear you'll face. Your problems ate twofold: First, ye've walked its halls before, and Halaster pays attention to those who visit him frequently (and he's the one you don't want to have watching you!). Second, you're looking for the lair of that lunatic wizard-murderer from Trades Ward. He's a dangerous lot, that Maddgoth, and many others met their ends by underestimating that pasty-faced little scarecrow. If you're looking to lay siege to Maddgoth's Castle, you're on your own- I've not visited it, and I'm not likely to, either. Truth be told, no adventurer I've heard of liked for Maddgoth's lair and returned to tell of it." 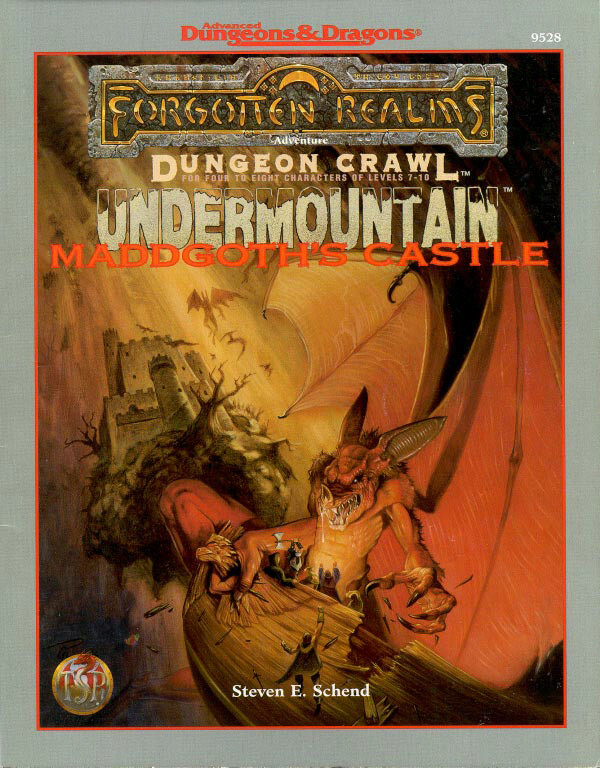 This Dungeon Crawl adventure returns once again to the hallowed halls of Undermountain and into an adventure like those AD&D game archetypes of years past. This is a stand-alone module, though characters from the Lost Level can be used. Game play- Hack and slash. Don’t look for any mushy romances, or intellectual orations. Kaedrin's Compatible and DMFI friendly. Play time- About 6 hours. Use your search skill to find secret doors. Use the control book for your favorite module settings. 4 companions are provided. You may choose any three at a time. Fighter, rogue, wizard, and cleric. for characters level 9-11. new characters level to 10. Decent adaptation, H&S. Everything worked well for me, even the dragon's conversation.